Before :- Jitendra Chauhan, J. For the Appellant (in Crl. A. No. 532-SB of 2001) :- Mr. R.K. Handa, Mr. Madan Sandhu, Advocates. For the Respondent (in Crl. A. No. 702-SB of 2001) :- Mr. P.S. Hundal, Senior Advocate with Mr. Dinesh Trehan, Advocates. For the Respondent :- Mr. Mehardeep Singh, Deputy Advocate General, Punjab. A. Indian Penal Code, 1860, Sections 307, 397 and 34 - Arrest of Accused - Accused persons (2) armed with pistols, snatched Rs. 81,500/- from the petrol pump - Test Identification parade not held - Accused not previously known to the complainants - Identified first time in Court - However accused were specifically named in the FIR - Vital contradiction in the statement of prosecution witnesses regarding the manner of occurrence - Robes the Prosecution Version of its Veracity - Accused conviction under Section 397 IPC and sentence of 7 years RI set aside. B. Indian Penal Code, 1860, Section 307, 394 and 34 - Medical evidence and ocular evidence - Prosecution version that accused fired a pistol shot from distance of 5-6 korams - Medical evidence injury suffered is possible if shot was given from 12 bore pistol from a distance of 6 mches to 3 feet - Moreover it must spread in the area of 15 to 16 inches - In instant case, injury was not spread even in the area indicated above - Held, ocular version totally inconsistent with medical version - Conviction of accused under Section 307 IPC set aside. Mahabir v. State of Delhi, 2008(3) R.C.R. (Criminal) 5 : 2008(3) R.A.J. 510 : JT 2008(5) SC 308. Matru v. State of U.P., 1971(2) SCC 75. Santokh Singh v. Izhar Hussain, 1973(2) SCC 406. Jitendra Chauhan, J. - This order shall dispose of two appeals i.e. Crl. Appeal Nos. 532-SB of 2001 and 702-SB of 2001 as the same have arisen out of a common judgment and order dated 17.4.2001 passed by the learned Additional Sessions judge, Hoshiarpur (hereinafter referred as 'trial Court'). However, the facts are being taken from Crl. Appeal No. 532-SB of 2001. 2. This appeal is directed against judgment and order dated 17.4.2001 whereby the learned Trial Court has convicted the appellants for the offence under Section 397 read with Section 34 and 307 of the Indian Penal Code and sentenced them to undergo rigorous imprisonment for a period of seven years each under Section 397 read with Section 34 of the Indian Penal Code and also to undergo rigorous imprisonment for a period of seven years each under Section 307 of the Indian Penal Code and to pay a fine of Rs. 1,000/- each and in default thereof, to further undergo rigorous imprisonment for a period of three months each. The substantive sentences were ordered to run concurrently. Mohan Lal to the effect that he had been working on petrol pump Tractor Centre, Bulhowal. On that day, at about 3.45 p.m., while he was counting the cash in the office of petrol pump, Bhupinder Singh son of Ajit Singh, resident of village Dholowal along with Satta, resident of village Bhulana came there and got petrol filled in their white coloured scooter carried by them. Accused-appellant Bhupinder Singh entered his office and demanded the receipt for a sum of Rs. 150/- and immediately thereafter, he took out the pistol from his dub and put the same on the temporal region of complainant-Amarjit Singh and started collecting bundles of currency notes lying there. After putting the same in the bag, accused-appellant Bhupinder Singh ran away from the office of petrol pump and then put the bag containing currency notes in the basket of the scooter which was in running condition and tried to sit on it, but complainant-Amarjit Singh, Kuldip Singh and Devinder Kumar on raising an alarm surrounded accused-appellant Bhupinder Singh, who fired from the pistol but it did not hit anyone. Accused Jaspal Singh @ Satta also fired from the pistol which hit the left thigh of Bhupinder Singh and he fell down. Accused-appellant Satta succeeded in running away on the scooter along with the bag containing Rs. 81,500/-. The police was informed on telephone and accused-appellant Bhupinder Singh was handed over to the police and on the basis of the statement, Exhibit PA, made by Amarjit Singh, formal FIR Exhibit PA/2 was registered against the accused. Investigation was conducted by ASI Mohan Lal and on personal search of the accused-appellant Bhupinder Singh, three live cartridges of 12 bore were recovered. Accused- appellant Bhupinder Singh was removed to Civil Hospital, Hoshiarpur. Rough site plan of the place of occurrence was prepared. 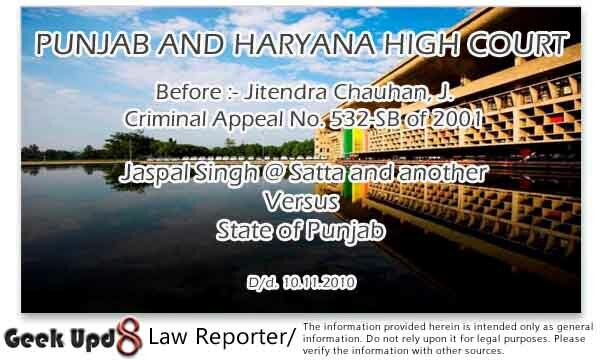 On 11/12.11.1999, accused- appellant Jaspal Singh @ Satta was arrested. On interrogation, he suffered a disclosure statement to the effect that he had kept concealed a sum of Rs. 20,000/- wrapped in a glazed paper near the link road Bur Jattan and offered to get the same recovered and then said accused led the police party and got recovered one envelope of polythene containing currency notes of different denomination after digging earth with his own hands and the same were taken into possession vide recovery memo, Exhibit PK. On 13.11.1999, accused- appellant Jaspal Singh again suffered a disclosure statement to the effect that he had kept concealed another sum of Rs. 20,000/- in the house of one Krishan Singh, elder brother of his father, situated in village Bheog Khiri, District Lakhimpur, State Uttar Pradesh , but nothing could be got recovered by the accused. After the report of Forensic Science Laboratory, Exhibit PN, challan was presented against the accused. 4. The accused-appellants were charge-sheeted for the offence under Sections 307,397 read with Section 34 of the Indian Penal Code and under Section 25 of the Arms Act to which they pleaded not guilty and claimed trial. 5. In support of its case, the prosecution examined as many as eleven witnesses, viz., complainant Amarjit Singh as PW1, Kuldip Singh as PW2, Devinder Kumar as PW3, Dr. ML Puri as PW4, Gopal Krishan as PW5, Kuldip Singh as PW6, Upasak Kumar as PW7, Head Constable Manohar Lal as PW8, ASI Mohan Lal as PW9, Constable Harbans Singh as PW10 and SI Manjit Singh as PW-11. 1. A lacerated wound 4.5cm x 4 cm on left thigh on its outer aspect, in its lower 1/3rd. Surrounding area is black signed F.B.P. 2. A lacerated wound 2.2cm x 0.4 cm linear placed on back of left knee. Underlying subcutaneous tissue probicity ant. F.B.P. 3. A superficial cut laceration 2.4 cm x 0.2 cm on centre of head, obliquely placed F.B.P. 4. Fresh oozing grazed abrasion 1.8 cm x 0.4 cm on left eyebrow. 7. PW9-ASI Mohan Lal has stated that accused-appellant Bhupinder Singh received four injuries and employees of the petrol pump told him that these injuries were received by him during the scuffle when the accused tried to run away on a scooter. 8. When examined under Section 313 of the Code of Criminal Procedure, both the accused-appellants denied the allegations of the prosecution levelled against them. Accused-appellant Bhupinder Singh further stated that on the day of occurrence, two unidentified persons came at the petrol pump of the complainant and in the meantime, he also reached there to fill petrol in his scooter. Appellant Bhupinder Singh also stated that the petrol pump was looted by those unidentified persons and while running, one of them left his pistol there after a scuffle with petrol-pump employees. He also stated that those persons succeeded in running and out of suspicion, employees of petrol-pump fired upon him from the pistol left by those unidentified persons which hit him on his left thigh and also gave him beatings. Appellant Bhupinder also stated that in order to save their skin, the employees of the petrol pump falsely implicated him in the present case in connivance with the police. 9. Upon appreciation of evidence, the learned trial Court convicted and sentenced the appellants as indicated above. 10. Learned counsel for the appellants has submitted that the accused- appellants were stranger to the complainant, but they have been specifically named in the FIR. All the employees working at the Petrol Pump Tractor Centre have admitted that accused-appellant Jaspal Singh @ Satta who allegedly fired at the spot was not previously known to them. Learned counsel has further argued that in such a situation, identification parade was warranted. In the instant case, no test identification parade was carried out. First time the identification parade was carried out in the Court which has no sanctity in the eyes of law. 11. Learned counsel has also argued that there are material discrepancies in the statements of complainant Amarjit Singh, PW1, Kuldip Singh, PW2 and Devinder Kumar, PW3 and Dr.ML Puri, PW4 . As per the statement of Amarjit Singh, PW1, shot which hit accused-appellant Bhupinder Singh was fired from the distance of 5/6 karams. However, as per the statement of Dr.ML Puri, PW4, the shot in the instant case was fired from 6 inches to 3 feet. Similarly, there is contradiction as regards distance covered by accused on scooter. Further, PW2 says that accused-appellant Satta @ Jaspal Singh was successful in escaping from the spot, but PW3 has stated that accused were nabbed by him, Amarjit and Kuldip after a chase. Therefore, learned counsel has argued that apart from the material contradiction in the testimonies of prosecution witnesses, the ocular version is not consistent with the medical evidence. 12. Learned counsel has further argued that accused Satta was arrested on 7.11.1999. During investigation, the accused made a disclosure statement, Exhibit PJ, and in pursuance thereof, recovery of currency of Rs. 20,000/- was effected. Learned counsel further submits that the alleged recovery was effected from the road side. No independent witness was associated either at the time of disclosure statement or at the time of effecting recovery, therefore, the recovery is totally untrustworthy. 13. Learned counsel for the appellant has further argued that the case property in the instant case i.e. arms, scooter, currency notes were never produced before the Court and, as such, an adverse inference is to be drawn against the prosecution. As per the statement of Kuldip Singh, PW6, Clerk, DTO Office, the scooter recovered in the instant case bearing registration No.PUH9942 stands in the name of Mohinder Singh. No investigation in this regard was conducted. The owner of the scooter was not produced, therefore, the scooter in question cannot be connected with the accused. 14. On the other hand, learned State counsel has submitted that in the instant case, one of the accused-appellant Bhupinder Singh was arrested on the spot, therefore, the question of false implication in the present case does not arise at all. The said accused-appellant was discharged after 3-4 days of the admission in the hospital. He has prayed for maintaining the judgment and order of the learned trial Court. 15. I have heard learned counsel for the parties and gone through the records of the case with their assistance. 16. The ocular evidence in this case consists of the statements of PW1- complainant Amarjit Singh, PW2-Kuldip Singh and PW3-Devinder Kumar. All of them stated that on 7.11.1999, at about 3.45 p.m., accused appellants Bhupinder Singh and Jaspal singh @ Satta came to the petrol pump. The scooter was kept in running condition by accused-appellant Jaspal Singh and appellant Bhupinder Singh went in the office of petrol pump where Amarjit Singh had been counting the cash. Both the accused appellants were armed with pistols and Bhupinder Singh put the pistol on the temporal region of Amarjit Singh and succeeded in snatching a sum of Rs. 81,500/- from the office. They further stated that the employees of the petrol pump raised an alarm and surrounded them. Bhupinder Singh fired from the pistol aiming towards the prosecution witnesses but they laid on the ground and saved their lives. PW1 to PW3 further stated that when accused-appellant Bhupinder Singh was taken in their folds, accused appellant Jaspal Singh @ Satta, in order to scare away the witnesses, fired from the pistol and it hit the left thigh of Bhupinder Singh and then he (Jaspal Singh @ Satta) succeeded in running away from the place of occurrence along with bag containing cash of Rs. 81,500/-. From the statements of Amarjit Singh, Kuldip Singh and Devinder Kumar, PW1, PW2 and PW3 respectively, it is positively established that the accused appellants were not previously known to the complainant. However, their names have been specifically mentioned in the FIR. This is also borne out from the record that no test identification parade was carried out. The accused-appellants were shown to the complainant for the first time in the Court. "As was observed by this Court in Matru v. State of U.P., 1971(2) SCC 75 identification tests do not constitute substantive evidence. They are primarily meant for the purpose of helping the investigating agency with an assurance that their progress with the investigation into the offence is proceeding on the right lines. The identification can only be used as corroborative of the statement in court. (see Santokh Singh v. Izhar Hussain, 1973 (2) SCC 406). The necessity for holding an identification parade can arise only when the accused are not previously known to the witnesses. The whole idea of a test identification parade is that witnesses who claim to have seen the culprits at the time of occurrence are to identify them from the midst of other persons without any aid or any other source. The test is done to check upon their veracity. In other words, the main object of holding an identification parade, during the investigation stage, is to test the memory of the witnesses based upon first impression and also to enable the prosecution to decide whether all or any of them could be cited as eye witnesses of the crime. The identification proceedings are in the nature of tests and significantly, therefore, there is no provision for it in the Code and the Indian Evidence Act, 1872 (in short the "Evidence Act'). It is desirable that a test identification parade should be conducted as soon as possible after the arrest of the accused. This becomes necessary to eliminate the possibility of the accused being shown to the witnesses prior to the test identification parade. This is a very common plea of the accused and, therefore, the prosecution has to be cautious to ensure that there is no scope for making such allegation. If, however, circumstances are beyond control and there is some delay, it cannot be said to be fatal to the prosecution. It is trite to say that the substantive evidence is the evidence of identification in Court. Apart from the clear provisions of Section 9 of the Evidence Act, the position in law is well settled by a catena of decisions of this Court. The facts, which establish the identity of the accused persons, are relevant under Section 9 of the Evidence Act. 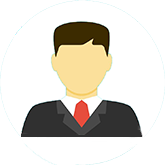 As a general rule, the substantive evidence of a witness is the statement made in Court. The evidence of mere identification of the accused person at the trial for the first time is from its very nature inherently of a weak character." 18. As per the case of the prosecution, the shot was fired from a distance of 5-6 karams. However, as per the statement of Dr.ML Suri, PW4, the injury in question suffered by Bhupinder Singh was possible if the shot is given from a 12 bore pistol from a distance of 3" to 6". He has further opined that if injury is given from a distance of 15-16 feet, it spreads in the area of 15 to 16 inches. In the instant case, the injury was not spread even the area indicated above. Therefore, the ocular version is totally irreconcilable with the medical evidence. 19. In the instant case, recovery of Rs. 20,000/- was effected from the road side which was an open place, accessible to the public at large. No independent witness was joined either at the time of making disclosure statement or at the time of effecting recovery. In the circumstances, the recovery becomes totally doubtful. 20. As per the case of the prosecution, the incriminating articles recovered in the instant case are arms, scooter and the currency. The case property was never produced before the Court for the reasons best known to the prosecution. In the circumstances, adverse inference has to be drawn against the prosecution. 21. The observations made by the learned trial Court regarding the deficiencies in carrying out the investigation does not help the prosecution to prove its case and the appellants cannot be allowed to suffer on account of the defective investigation. The prosecution has to stand on its own legs. 22. The vital contradictions in the statement of prosecution witnesses with regard to the manner of occurrence and the ocular version being totally inconsistent with medical version makes the case of the prosecution doubtful. 23. In the circumstances, it is amply proved that the prosecution has suppressed the true genesis of the crime. In the present case, prosecution witnesses in their depositions admitted that the accused appellants were not previously known to them, but their names have been mentioned in the FIR. No test identification parade was held. The accused-appellants having been identified for the first time in the Court, robes the prosecution version of its veracity. 24. In the circumstances, both the appeals are allowed and the impugned judgment of conviction and order of sentence, dated 17.4.2001, passed by the learned trial Court is hereby set aside. The appellants, who are stated to be on bail, are acquitted of the charges against them. Their bail bonds shall stand discharged.